At times the thought of arranging a funeral seems too difficult for those who have recently suffered a loss. Our experienced staff is here to help lighten your burden and remind you of the true value a ceremony can hold for you and your family. The thought of planning a burial service may be very overwhelming and painful if you have recently suffered a loss. We’re here to help make this journey as easy as possible by offering you compassion and support combined with our experience in planning all aspects of funerals and memorial services. A final ceremony can hold deep value for you and your family, as it celebrates the life of your loved one and offers a way for those who are left behind to unite in remembrance. When you lose someone close to you, coping with the loss is never easy. A funeral service is a way for those who have been left behind to start healing and eventually find closure. Although there is no rush in the grieving process, a service may help you to more fully experience and express your feelings, while coming to terms with the loss. Bringing together family and friends helps everyone connect, share memories, and offer each other much-needed comfort and support. At All County Funeral Home & Crematory, members of our experienced staff are here to assist you in planning and implementing a meaningful service that celebrates your loved one’s unique life. A funeral is held within a few days of your loved one’s passing and is usually held in a funeral home or church. The body of the deceased is typically present. This ceremony can be held before a burial or cremation. 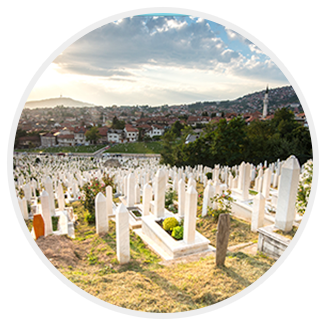 Graveside burial service is held at the location where your loved one will be buried, which could be a grave, mausoleum, or columbarium. It may be done after a funeral or as the stand-alone service to remember your loved one. These services give friends and family the opportunity to be nearby as the body is moved to its final resting place. A memorial service is held more than a few days after the person has passed. The body is usually not present, and it can be held at any location you deem significant or appropriate, including a family member’s home. Green burial services are a more natural option, giving you the peace of mind, knowing your loved one's remains will be reunited with the earth once again and conserve land for the future. We understand that the desire for an immediate burial sometimes arises. An immediate or direct burial is one in which your loved one’s remains will be buried in a modest container without a formal ceremony or public gathering. This is a simple and affordable option for disposition of remains, and it costs a fraction of what a traditional funeral service would cost. 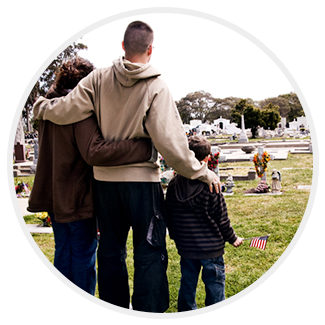 An immediate burial is a very simple and effective choice if cost or time is of high concern. If you choose a direct burial, there will be no embalming and no viewing or visitation. Once you have buried your loved one, you may choose to have a memorial service at a later date. Are There Other Options Besides a Ground Burial? Ground burials are the traditional choice in most cases, but there are also other options. Cremation is having the body exposed to strong heat causing it to burn and leave ashes behind. Once the body has gone through this process, these ashes can be kept in an urn or scattered in a place that was meaningful to the deceased. Above ground, alternatives include being buried in a mausoleum or crypt. A public mausoleum has space for multiple individuals, while a private mausoleum typically only holds the remains of one or two family members. If My Loved One Chooses to be Cremated, Can We Still Have a Burial and Memorial Service for Them? If your loved one has specified that they want to be cremated, you may still choose to have a burial and a memorial service in their honor. Some families postpone the actual cremation until after a traditional viewing and visitation. Once the body is cremated, a memorial service and burial can be held at any time. There isn’t a simple answer to the question of how long you can wait after a death to bury an individual. You may feel shocked or overcome with grief at first and wish to postpone dealing with planning any kind of service. Services can be held as early as 24 hours after a death, but are typically scheduled for three to seven days after passing. There are other factors that may impact when services will be held, such as religious and cultural traditions, family travel limitations, and weather. The burial method you choose will also have an impact on how much time you can wait to have a burial. If a body is not embalmed, burial should be done as soon as possible. Embalming a body allows a little more time to plan a service. If the body is cremated, services can be held at any time after cremation, per the family’s discretion. Many people are choosing to prearrange burial services rather than leaving loved ones to deal with the stress of making arrangements after death. When you preplan your own final services, you relieve your loved ones of making these decisions in a time of grieving. Losing a loved one is never easy. At All County Funeral Home & Crematory, our experienced staff is here to answer any questions you may have. With compassion and ease, we can help guide you through the process of making arrangements for services in honor of your loved one. Contact us to arrange a burial service for yourself or a loved one today.rs a way for those who are left behind to unite in remembrance.